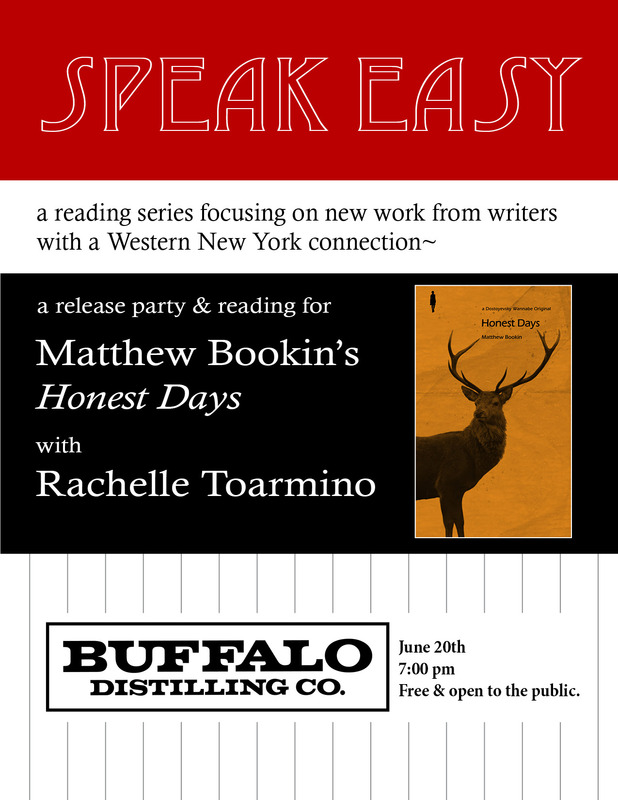 June’s Speak Easy is a release party for Matthew Bookin’s Honest Days. Matthew Bookin is the author of HHonest Days (Dostoyevsky Wannabe) and Palace. His work has appeared widely online and in print. He is the cofounder and fiction editor of PEACH MAG. Rachelle Toarmino is the author of the chapbook series of paparazzi poems, Graphic, and the chapbook of embroidery poems, Personal & Generic. She was recently longlisted for the Cosmonauts Avenue Poetry Prize with guest judge Tommy Pico, and was named Buffalo Seminary’s 2018 Elizabeth McNulty Wilkinson Poet. She is the cofounder and editor in chief of Peach Mag, and teaches Spanish at a local elementary school.